"This shop is fabulous!!" The group entering won't hold back their enthusiasm. Small wonder, it's like suddenly stepping from rather bleak urban surroundings into a jungle, or at least a conservatory. Amidst the lush greenery, almost hidden, you'll find Jin. Petit with delicate features and dark hair, she is the founder and co-owner of the appropriately named Conservatory Archives. Looking certainly younger than she must be, the South Korean came from Seoul to London at the age of thirty. Jin had a designer's background when she arrived in the UK. At the Agricultural College in Essex she followed this up with a Bachelor's degree in horticulture. Naturally, she wanted to combine her design skills with her love of plants. So originally she planned to go into garden or landscape design. But - luckily for the denizens of London - she was also taught about trading and learned about the Dutch plant industry. Moving to the British capital after completing her studies she found that indoor gardening was important in urban areas: "I would say this is the future young horticulture". So the idea grew to open a shop instead. Jin had no particular area in mind but started looking all over London for a site to open her business. When one day she spotted what had been the old ironmongers shopfront on 493-495 Hackney Road from the top of a double-decker bus, she knew that this was what she wanted. "I especially loved the huge window front and then, once inside, the double-height space. It reminded me of a conservatory." And this is how she came up with the name Conservatory Archives. Not immediately though, but over weeks and months of getting the shop ready. Together with her partner Giacomo, an Italian who studied mathematics, Jin did much of the work herself. Laughingly calling herself "the queen of DIY", she vividly remembers her aching arms and back from all that sanding and staining of the wooden floor. They arranged the lighting on the 4 metres high ceiling themselves and, when the old fireplace collapsed, bricked it up and rendered it - all without ever having done so before. She's modest about their achievements though, commenting simply: "I don't think we need much detail here - there are millions if I have to talk about this..."
Giacomo's parents sourced antique tiles from an old Italian chapel which now adorn the smaller of the two rooms. But Jin also tried to keep some of what had survived in the shop from times past, or - in her words - "to not waste what was still there". In some way this attitude is also reflected in the shop's name: "Archives means like 'through the time'. It's not an instant thing." "There is a craving for greenery here..."
Eventually though, everything was ready - or at least ready enough to open. In mid-December 2015 she threw a little party and invited people in. The timing was well-chosen, indoor plants being such a trend in London these days. Also, of course, they make nice (Christmas-) presents. Jin suggests there is a craving for greenery here. Her plants are certainly much in demand and the almost constant stream of customers seem excited not just by what she has to offer but by the presentation as well. 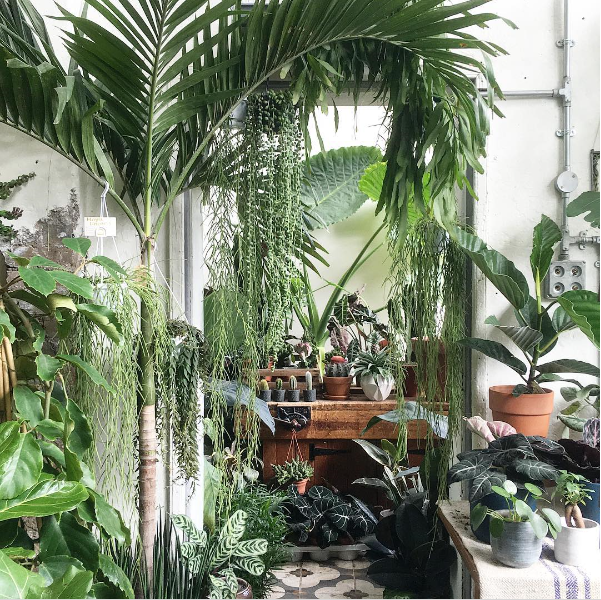 Conservatory Archives is crammed to the rafters with plants, emanating a truly jungly feel. As with so many trendy shops and cafes, the paint seems flaking on purpose. Here, however, it adds to the feeling of being in an old conservatory. An old leather armchair is hidden amongst the lush vegetation - sole reminder of the fact they also sold vintage furniture here when they first opened. "I've always loved design and vintage pieces and picked up quite a few over the years. In the early days I'd use them to decorate plants on and also sold several. But this space is too small for selling furniture, really." There certainly is little room to tread. Without meaning to I knock over two pots - one with my bag and one when stepping back to let someone pass. I'm truly embarrassed, but Jin is very gracious about it. Luckily, I did no more damage than spill a bit of dirt... How does she manage to water them all, I wonder, thinking of the time I spend on my houseplants? "Oh, it's not that bad", she laughs, "we have a pretty high turnover which helps. And the succulents don't need that much anyway. But yes, watering is part of the job." Ah yes, the succulents. There is a huge variety on offer and Jin clearly loves them. So do her customers: whilst we talk a well-dressed elderly lady steps in and enthuses "Look at them! I'm from South Africa, so I'm going for all these...!" But what makes Conservatory Archives stand out in my eyes - compared to other trendy plant shops - is the fact that she has so many else on offer. There's an ever-changing phalanx to be found. Today I spot unusual Dracaena species, ornamental Asparagus, a host of different Maranthas and Calatheas, several Alocasia species, some I've seen nowhere else for sale before, Diffenbachias, Peperomias, Philodendrons, ferns, orchids (not the ubiquitous Phalenopsis but Masdevallias among others) ... The list goes on. Jin confirms that she tries to find something new every time she orders from her suppliers in Holland, Belgium or Denmark, something she hasn't seen before. And she admits: "I do it as much for myself as for my customers..." She loves discovering new plants and new trends: "I'm excited about the Dutch hybridizing programme. Also, Holland is really big on trends, they know so well about them. Take Chinese Money Plants [Pilea], for instance: they are huge right now. A few months ago tiny plants were sold for £30 in London. But they are easy to propagate from cuttings. So I told this girl: 'You've got to grow and propagate these!' - and now we can sell them for just a few pounds." Jin may not have the time to multiply plants herself anymore, but she did so once: "When I was a student in Essex, I was so bored because there was so little to do. So I would constantly propagate and grow plants in big trays on my windowsill. Succulents mainly. I really enjoyed that." "Customers shouldn't need to know much about plants - but us professionals must"
And now it's her customers discovering the joy of growing plants. Many come back regularly. Perhaps they also return because Jin seems to have a particular gift: "I remember all my customers' faces and what they've already bought so I can make recommendations." But what if someone is anxious or undecided? "If customers are worried I just recommend something easy to start with and say 'Relax. You're not going to kill the plant! Just don't panic and water it too much." She says she asks about where and how people live: "Like, if the place is sunny or shady and also if it is rather warm or whether they prefer to keep the temperature down. Some species really need warmth to thrive just as other's wont cope well with heat." Her customers, she says, aren't too fussed about plant knowledge nor - according to Jin - should they be. "They should not need to know much about plants to enjoy them. But we as professionals need to." So how then does she know how to treat all these new plants she's not come across before but now offers to her customers? "I'm still learning. I ask and I read up on them - especially, where they originate from. Then it's easy to know what they want and need." If I understood her correctly, she also has a philosophical take on the matter: "Rather like our own lives, understanding plant life is no exact science or shouldn't be just that. Viewing it like this makes things much easier and more enjoyable. Two organisms (i.e. plant and humanbeing) living together in the closed environment of an indoor space... of course, sometimes things may get complicated. But as in real life, you work things out." Sounds as if she has naturally green fingers. Has she grown up with plants, I wonder? As it turns out: No. "Seoul is not a very green city. It's very tight and crammed and there is no space for gardens, really. At least not private gardens - just windowsills, or perhaps a balcony." It's not just London homes, though, getting the plant treatment these days. An ever increasing portion of Conservatory Archives' customers are other businesses. Jin did plant installations for Marks & Spencer, for Bentleys, for London Design Week, for Cos & Hay and lululemon, for instance. And these are just some of those she mentioned. How do these co-operations come about? Jin says she has never done any advertising: "Just word of mouth and people passing by and stepping in. Since there are so many creatives around in this part of London, this has led to some interesting commissions. By now though most business comes via Instagram. It's really good and has been a huge driver." Jin tells me that in fact she does some work with other businesses pretty much every week. "While I love best being handed complete creative control over installations, often I'm just the plant supplier and horticulturist. I rarely put these jobs on Instagram, but I love them all the same." There's one thing that struck and surprised me on meeting her: Jin doesn't seem to be a "natural entrepreneur", at least not if measured against the stereotype. She confides that when she first opened her shop she found it hard to cope: "I was very anxious about facing customers, about putting myself 'out there' and meet and talk to them. They were all strangers." She is still very soft-spoken. Used to rather booming voices, I have to lean forward and embarrassingly often ask "Pardon?" just so I can hear what she says. Other worries are probably shared by most if not all new entrepreneurs: "You worry when you take out a long commercial lease: is that the right thing to do or will you end up with life-long debts?" But here, too, she has grown into her role: "I'm much more confident these days." Actually, despite these professed worries, there must be a very strong and brave core to her character. It takes quite something to leave your profession after a ten year career, and move not just country but continent, too, to a different culture, looking for a new challenge in your life. But that's exactly what Jin did: "It was time for something new" she simply says on why she came to the UK in the first place. That's what I call an inspirational woman! 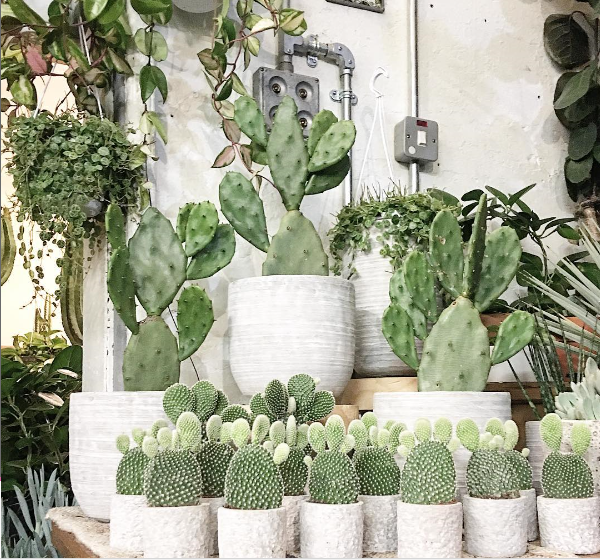 And aren't plant lovers in East London lucky she decided to turn a tiny shop with an old history into a green oasis that - like the fairy tale's sweet porridge that does not stop flowing from the pot - never runs out of plants, no matter how many are snapped up and carried away?